Hey there! 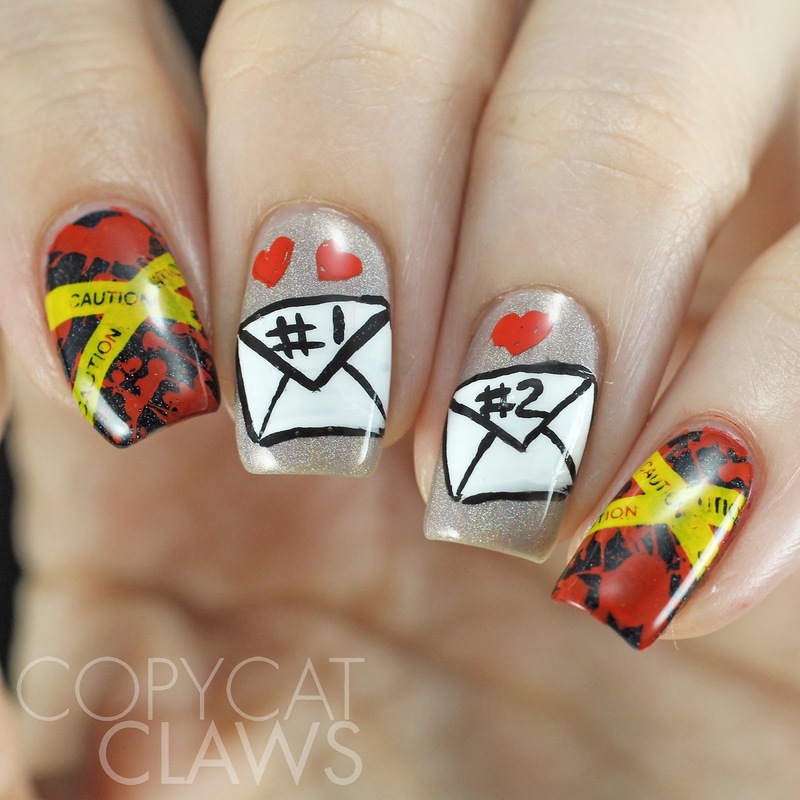 It's the last day of the month so it's time for some book-inspired nail art. 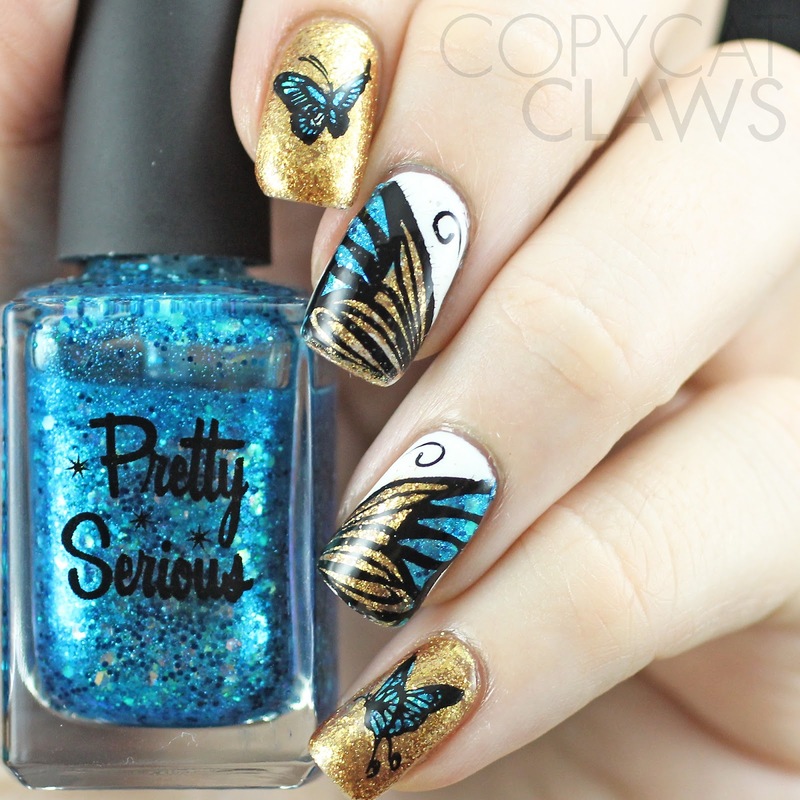 The Polished Bookworms is a Facebook book club where we all read the same book and then do nail art inspired by the book. This month's book was Gone Girl, which I actually read a couple of months ago. For folks that have already read the chosen book, they have the option of reading an alternate but I was already into one of the books for later so I'm just going with Gone Girl for this month. 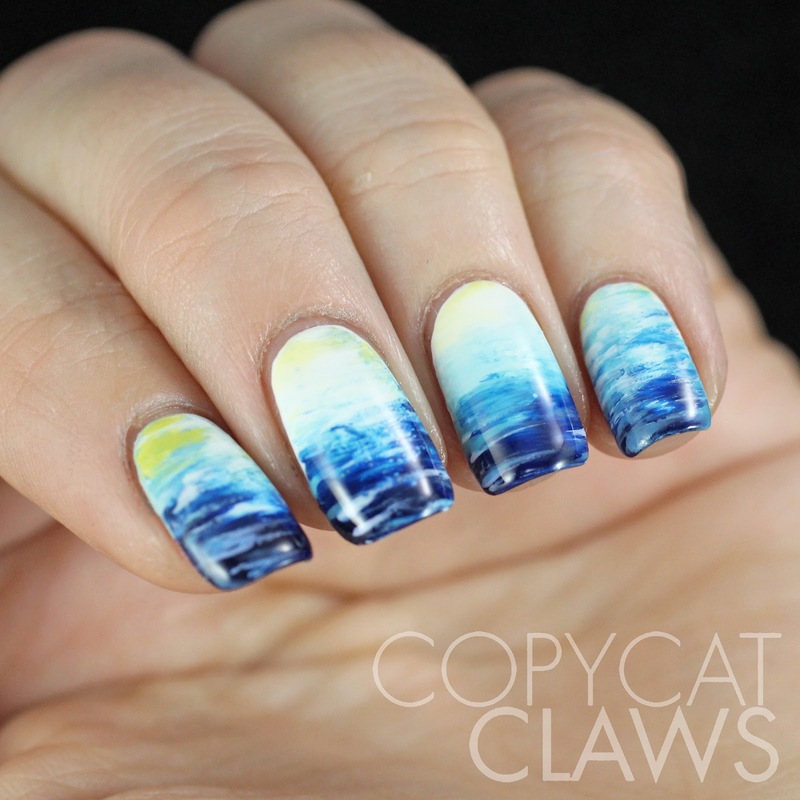 For anyone that hasn't read Gone Girl, or seen the movie, don't worry I'm not going to spoil the book for you so feel free to keep reading for my explanation of this random-looking nail art. Hey there! 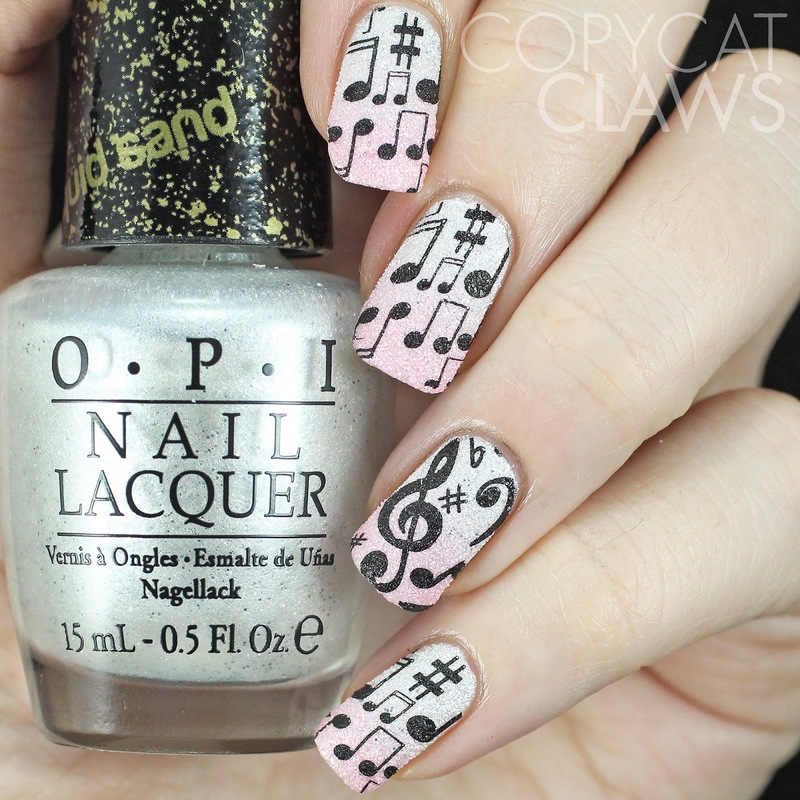 This week's prompts for the Crumpet's Nail Tart's 52 Week Pick n Mix Challenge are Music and "Not Worn Enough". 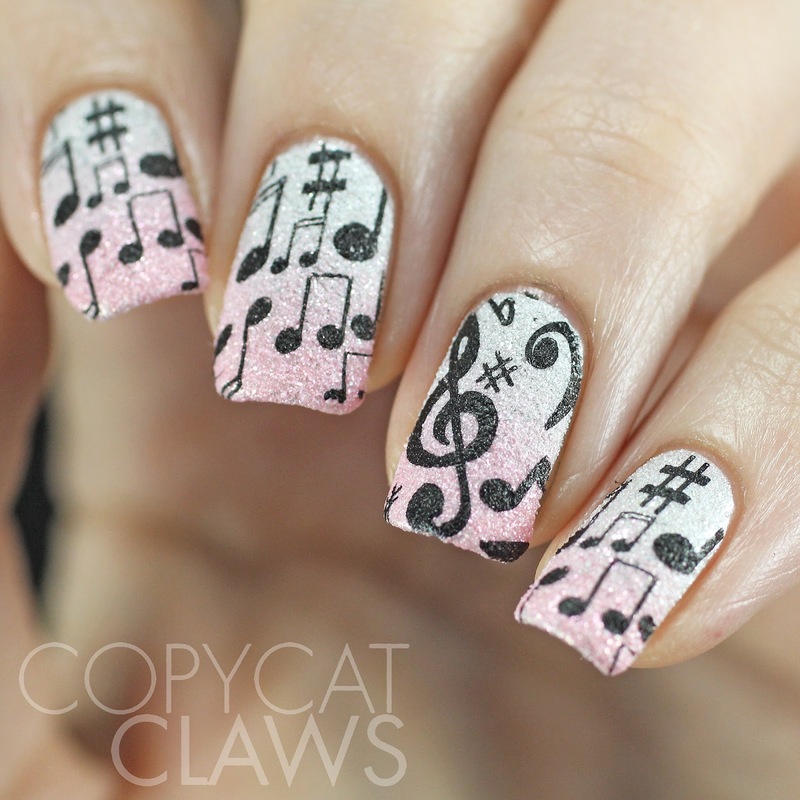 I personally rarely wear any of the numerous textured polishes I have so I used this opportunity to use a couple of OPI's textures as the base for this music note stamping. And I really liked it so maybe I'll remember to use them a little more often now. Hey there! 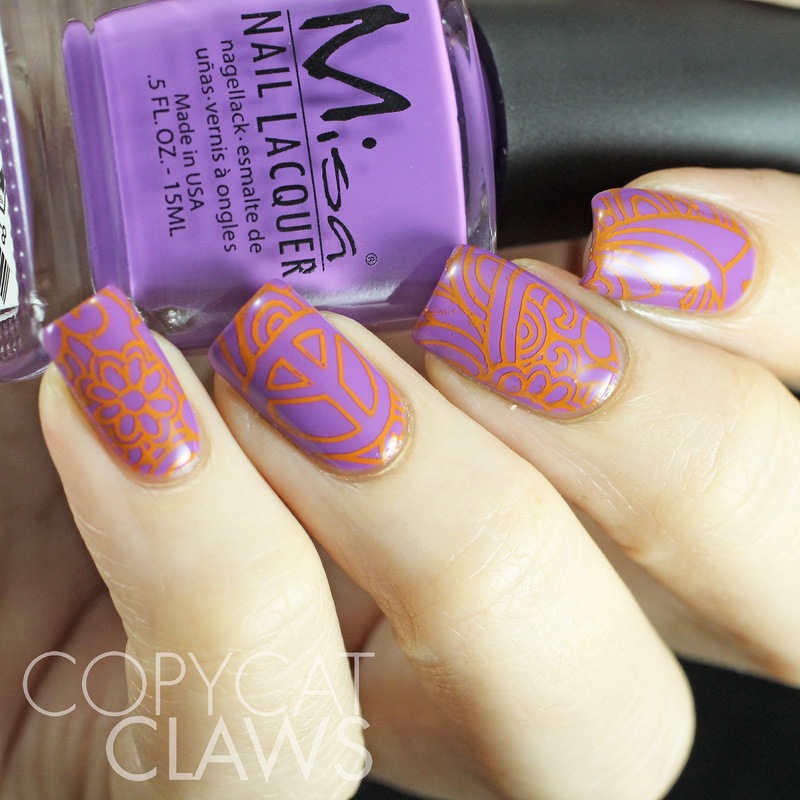 It's time for this week's mani for the Sunday Stamping challenge. 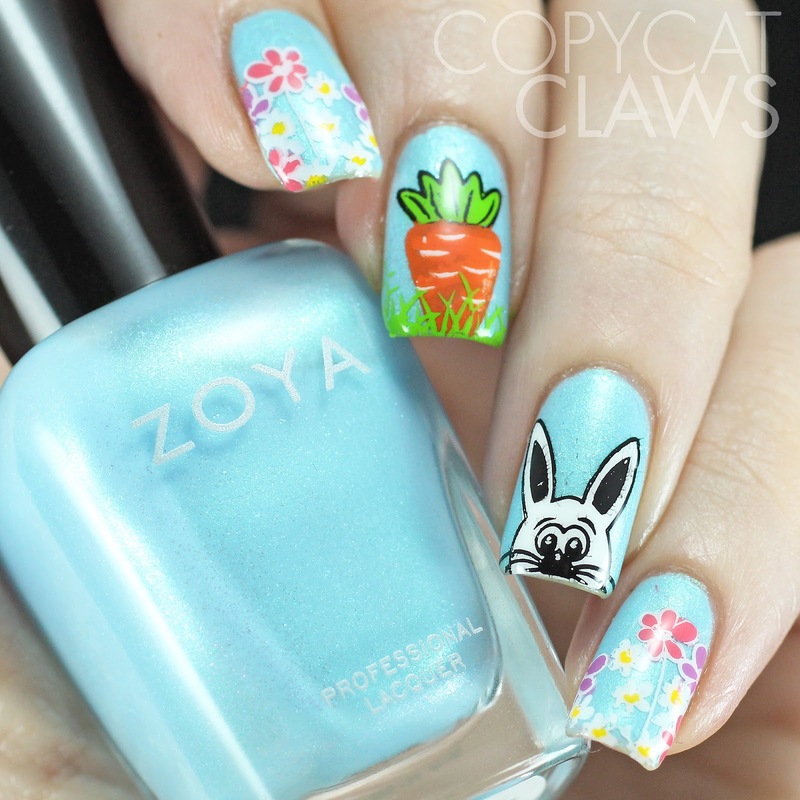 Since next weekend is Easter and folks might be too busy celebrating to do their Easter nails on Easter Sunday, it's the theme for this week. Of course I'm posting pretty late on Sunday, as is my style, because I just got home. I left this morning for brunch and didn't get back home until 9 pm after going to another friend's house for birthday dinner. Busy, busy day! Good thing I got these done a couple of days ago so I didn't miss today's challenge. Hey there! Today's post is for a little boy named Seth that you've probably heard of. Seth Lane is a 5 year old boy in the UK who is living with Severe Combined Immunodeficiency, meaning he has no immune system and has to undergo a second bone marrow transplant. If you'd like to read his story, his parents have been documenting his journey online here and a couple of weeks ago they posted a video of him asking everyone to join in wearing yellow (his favourite color) on March 27th. That's today so I'm donning some glow in the dark yellow nail polish today, along with the only yellow shirt I own, just for him. Every kid loves things that glow in the dark, right? Hey there! Today's post is a quick and easy one. 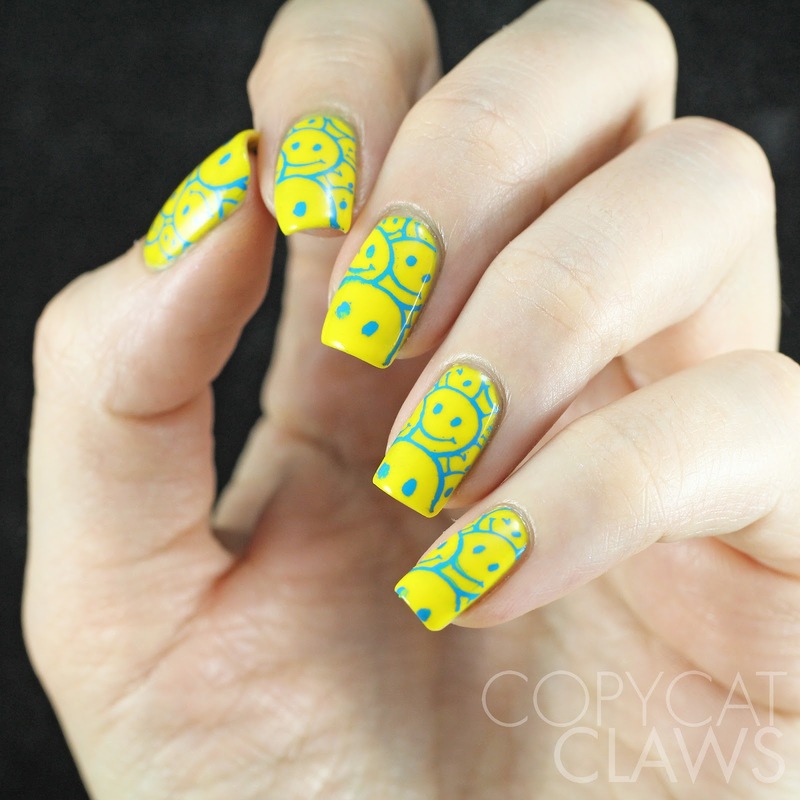 A blobbicure! This is my first time trying this technique and I think I like it. Interestingly, this was inspired by a pile of rocks I walked by. I thought "hey I should do a grey/brown blobbicure" which was a bit shocking since I'm usually drawn to bright colors for my nails. Hey there! Today I have another instalment for the 52 Week Pick n Mix Challenge. 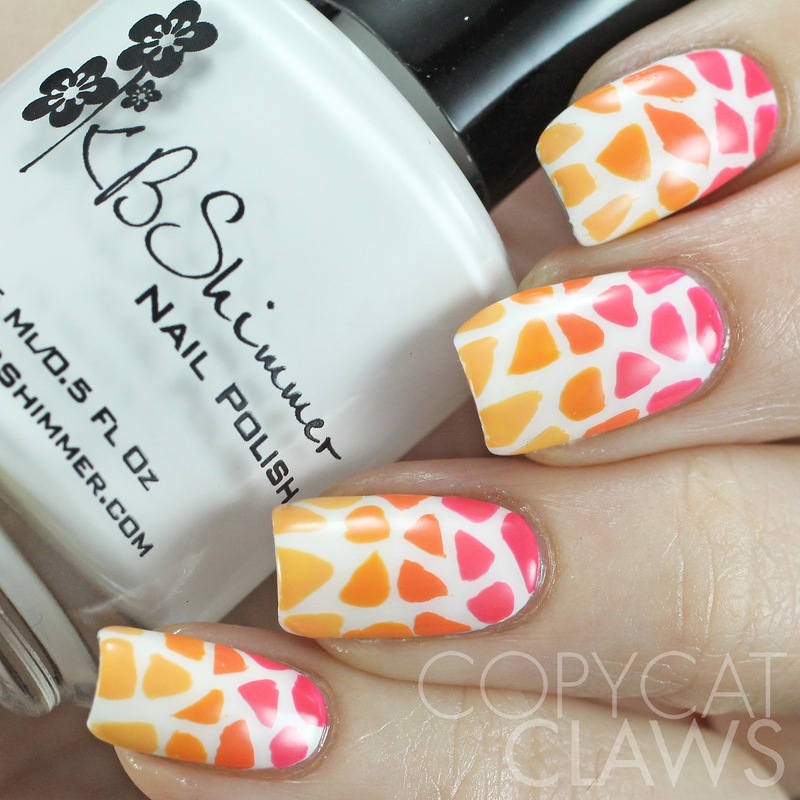 The themes are mosaic/stained glass and pink & orange. Honestly I had zero idea what I was going to do for these so I kept putting them off (I usually try to be a couple weeks ahead in case I have to go AWOL for any reason). But when I finally did these I really like how they turned out. Hey there! How's everybody's first weekend of spring going? Mine came with lots and lots of snow and a really long walk to help my friend drop off his political flyers...followed by not getting off my couch for the next 36 hours, haha! 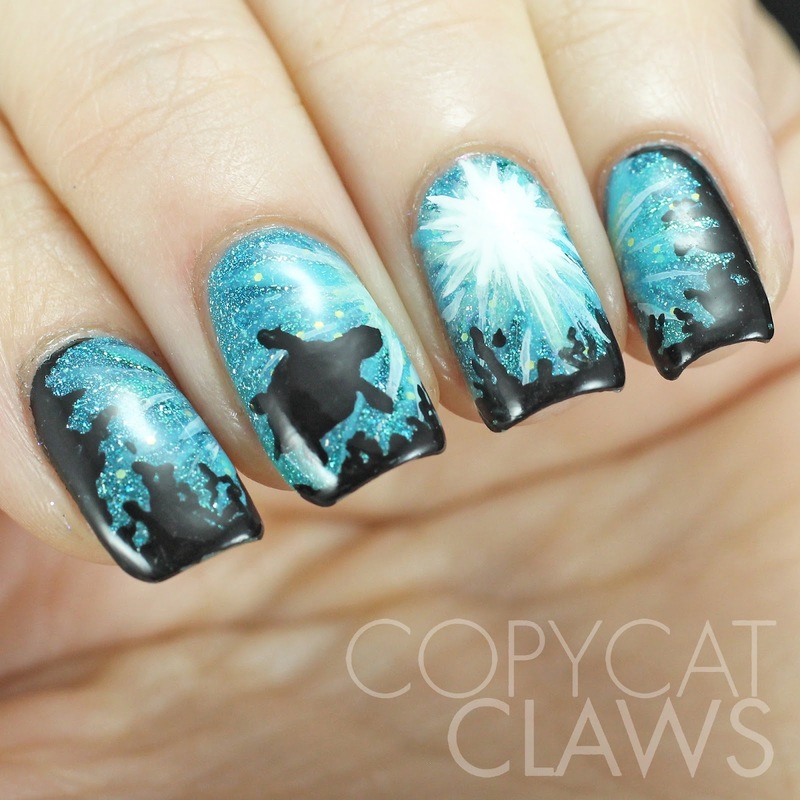 But today's nails don't fit with my snowy environment at all. 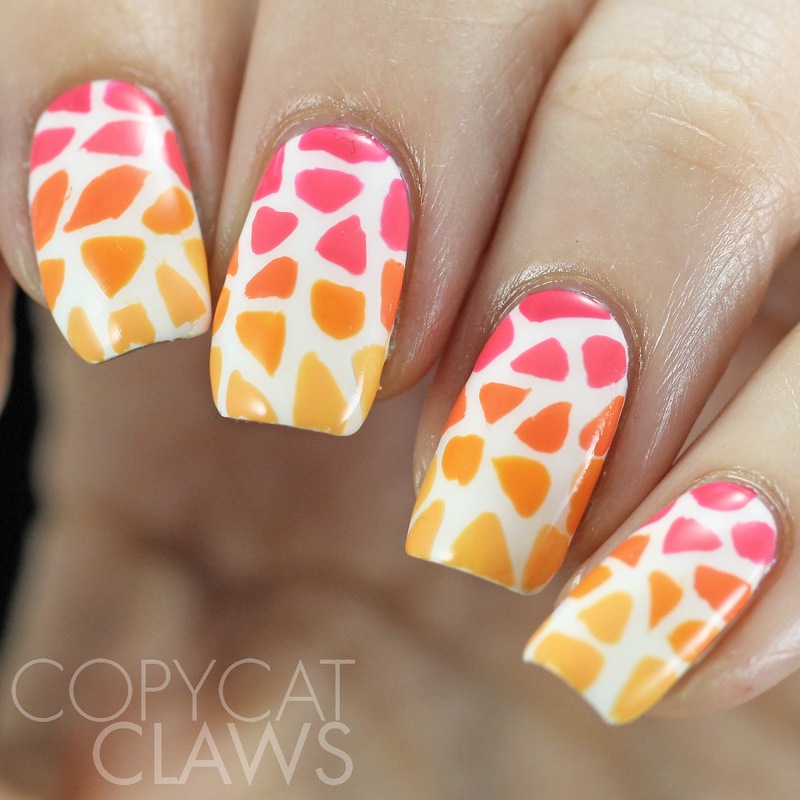 This week's Sunday challenge theme is "purple & orange" so I came up with this bright mani. Hey there! In case you're not aware, I adore sheer polishes for leadlighting. I love the 10.1 Polish Icing collection, the Loaded Lacquer Jiggles and, more recently, I fell in love with the Esmaltes da Kelly Soap Bubbles collection. 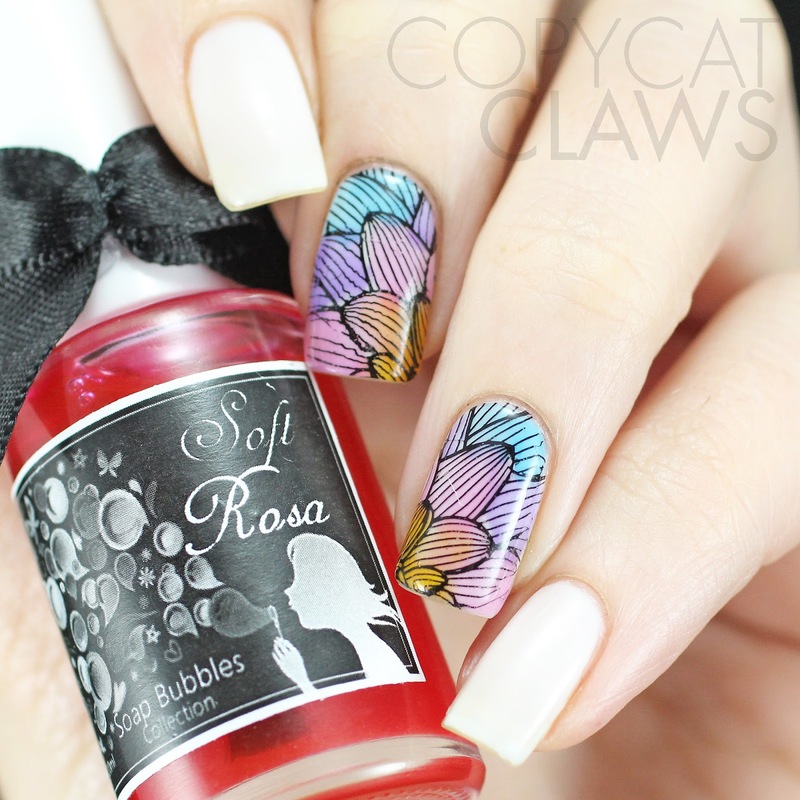 So when I saw Esmaltes da Kelly had released neon Soap Bubbles AND Soft Soap Bubbles (a toned-down version of the original Soap Bubbles), of course I bought them both (sorry, wallet). 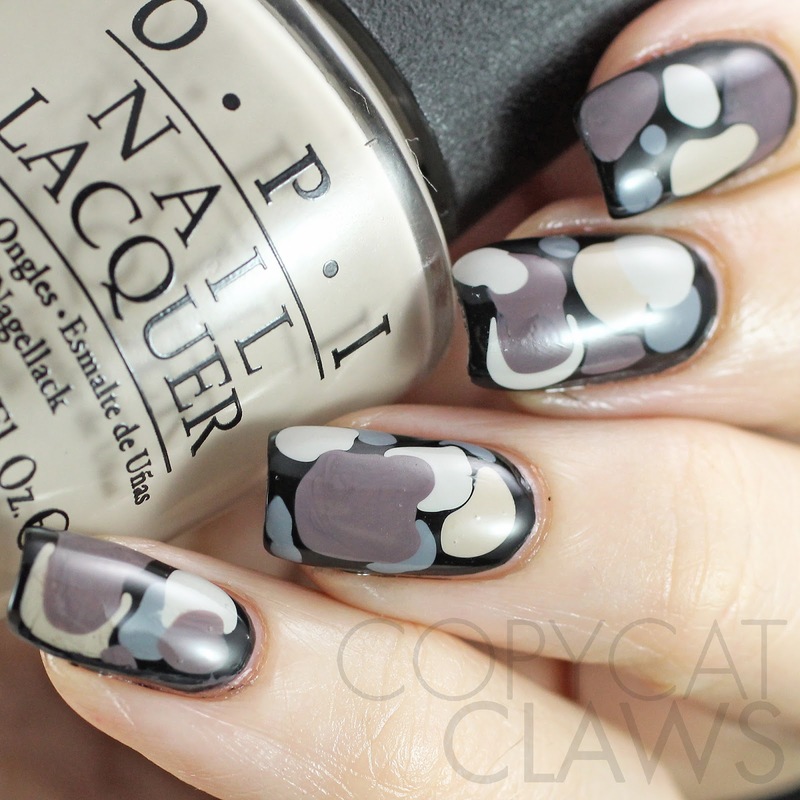 Today's mani is the first one I've done with the soft ones, using my new favourite plates from UberChic Beauty. Hey there! I've got the worst cabin fever and am craving summer so I've already busted out the neon polishes (not that I ever put the neon polises away). When I posted this watercolor nail art on Instagram a couple months ago, it got a lot of comments asking how I did it so I decided to do it again with bright colors so I could take a little video (which will be on my Instagram sometime tonight). 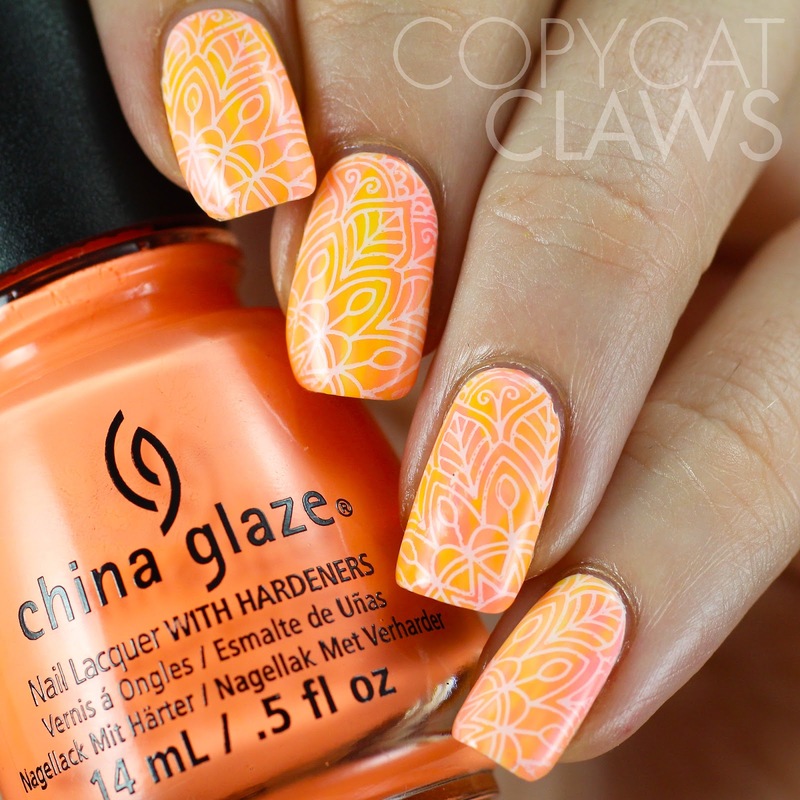 Luckily this time the stamping didn't ruin it! Hey there! Happy St. Patrick's Day friends! I hope you enjoy the celebrations in whatever way you choose to, if at all. Personally, I'll be painting my nails in front of my TV...in other words a normal Tuesday night. 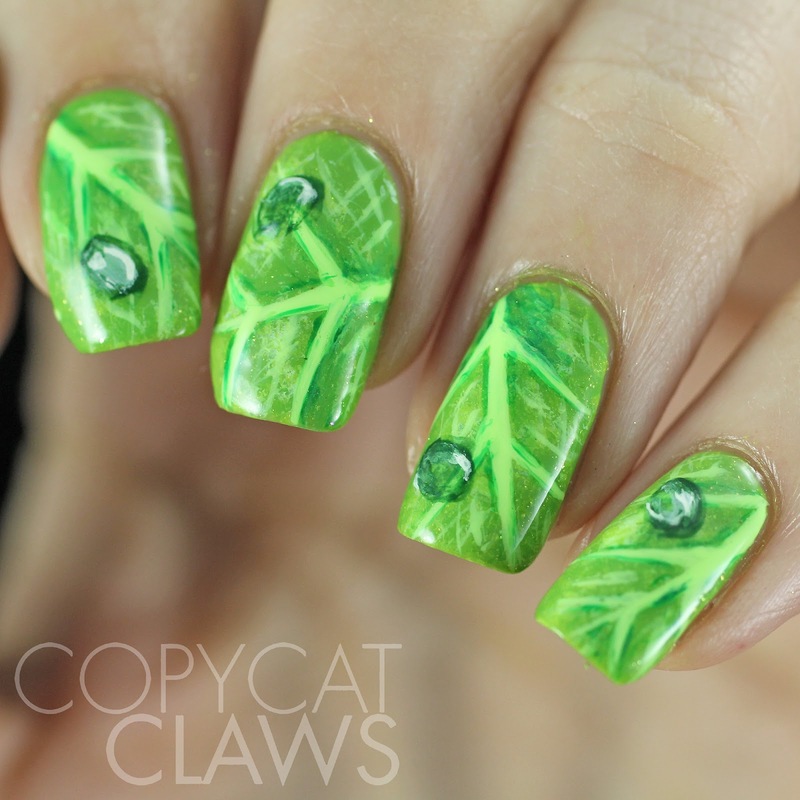 I meant to post these on Sunday for the Sunday stamping challenge but I completely failed in my blogging attempts on Sunday. 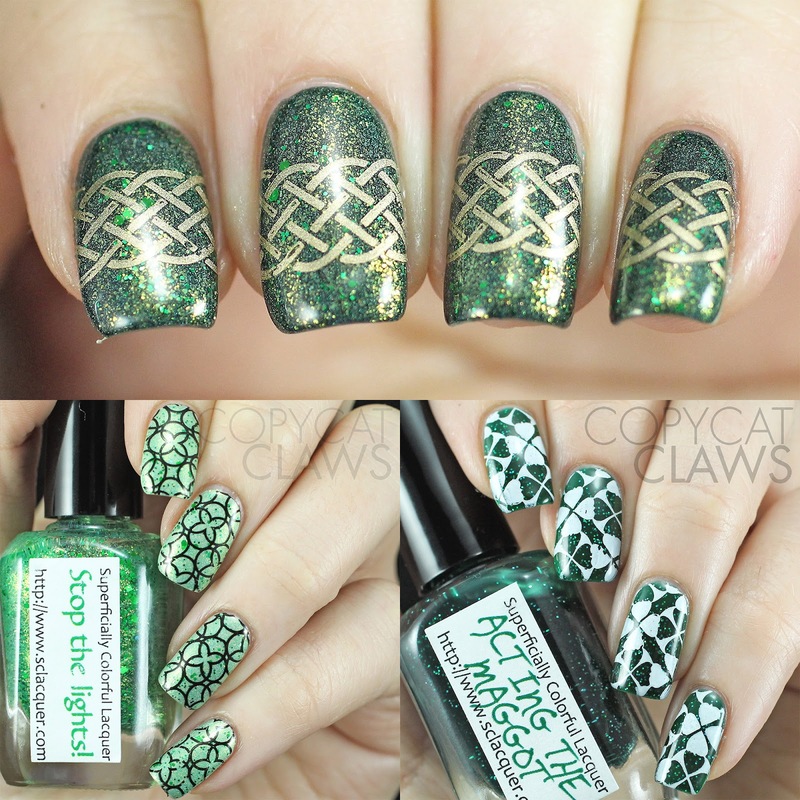 So here is my latest St. Patrick's Day stamping. Hey there! 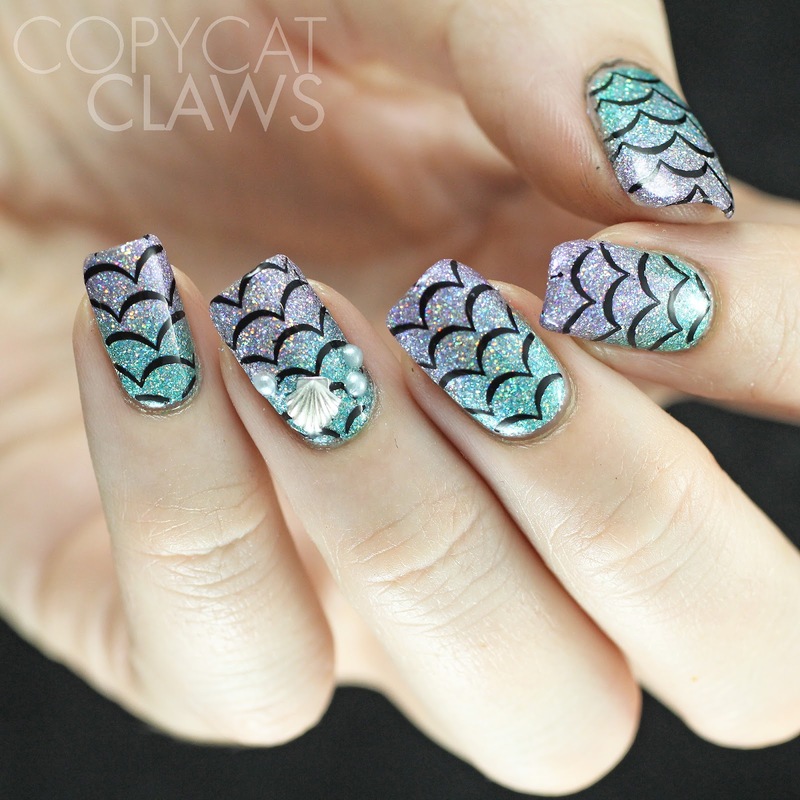 This week's 52 Week Pick n Mix Challenge prompts are Mermaid and Lilac & Green. I'm in! 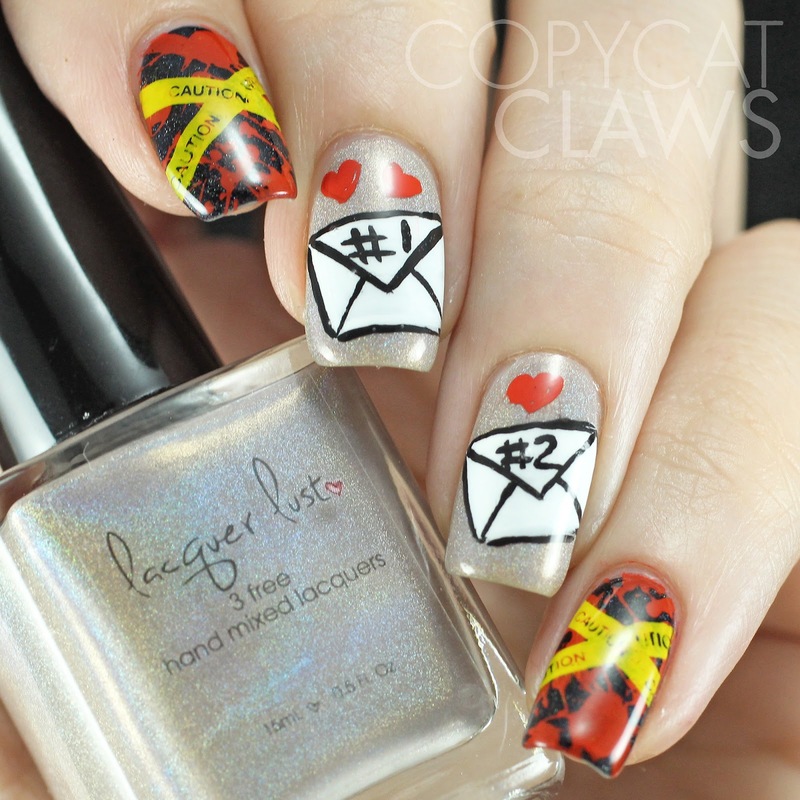 I've done a really similar mani before but I didn't care. 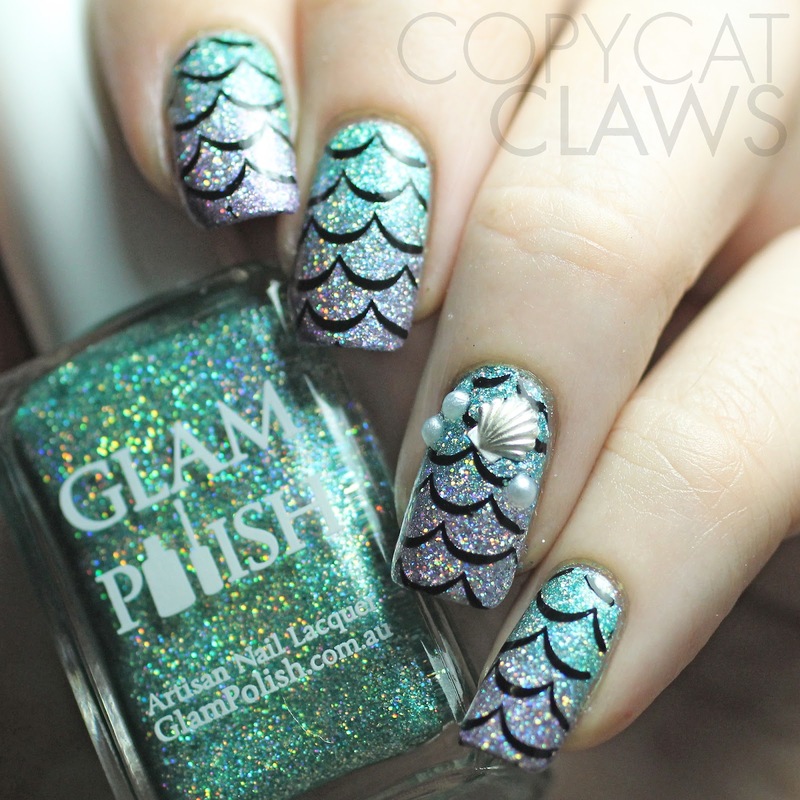 I love me some mermaid nails! And it gave me an opportunity to use a couple of sparkly Glam Polish holo glitters I recently bought so it was a no-brainer to do them again. Hey there! It's the last day of The Digit-al Dozen's Nature Week and I have to say I'm so sad to see this week go. 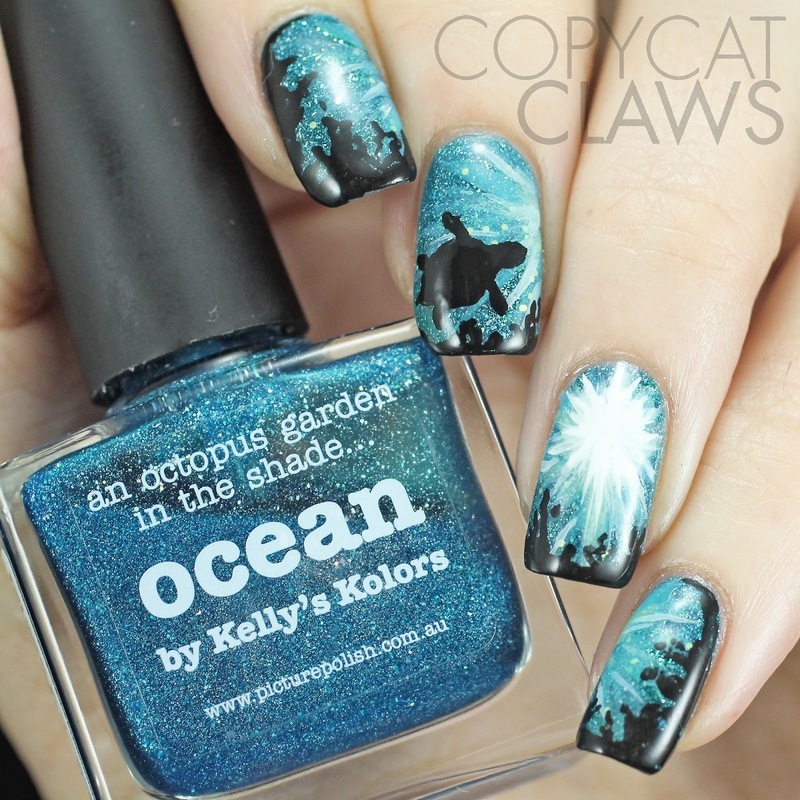 It's been my personal favourite and the other girls have done such incredible nail art! 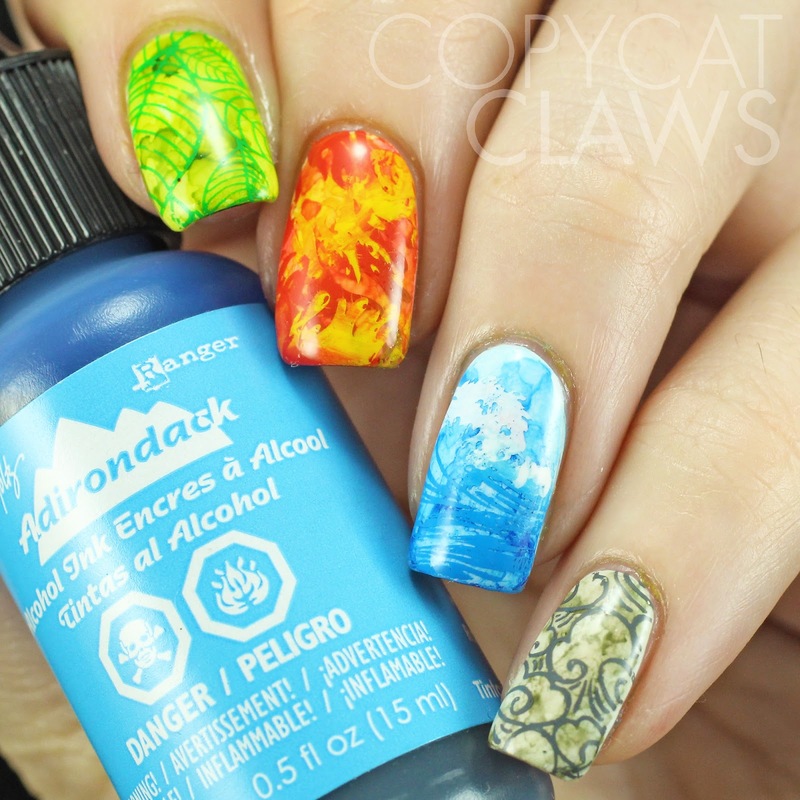 For today's post, I busted out the alcohol inks and did some stamping over it. Can you guess the theme? Here's a hint...it's the elements. Hey there! It's Day 4 of The Digit-al Dozen Nature Week. 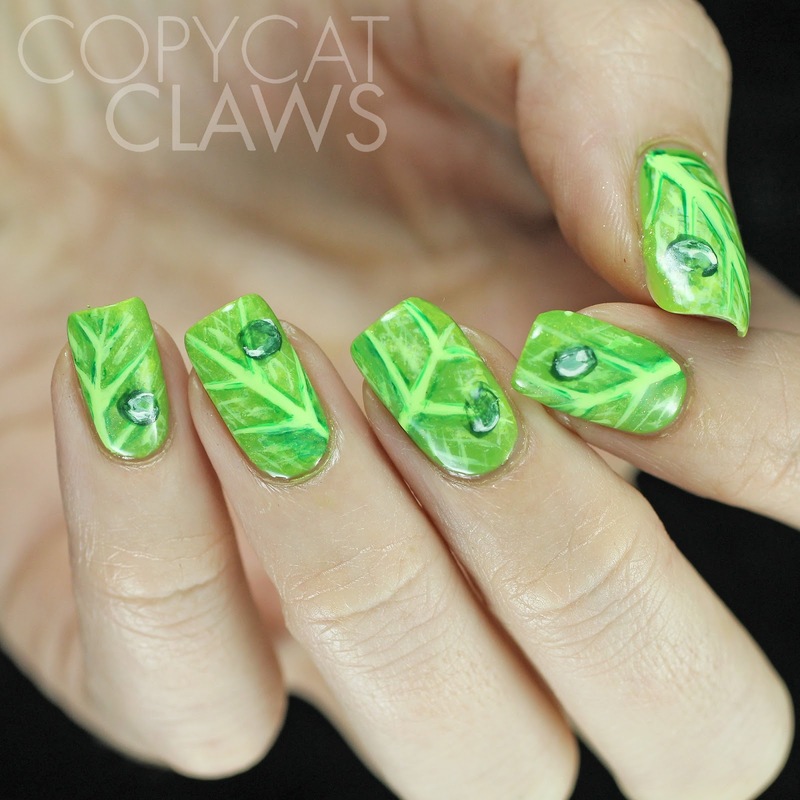 I hope you can tell that for today's mani I tried to create dew drops on leaves. This was something I'd been wanting to do for awhile and it was so much fun to try! Hey there! 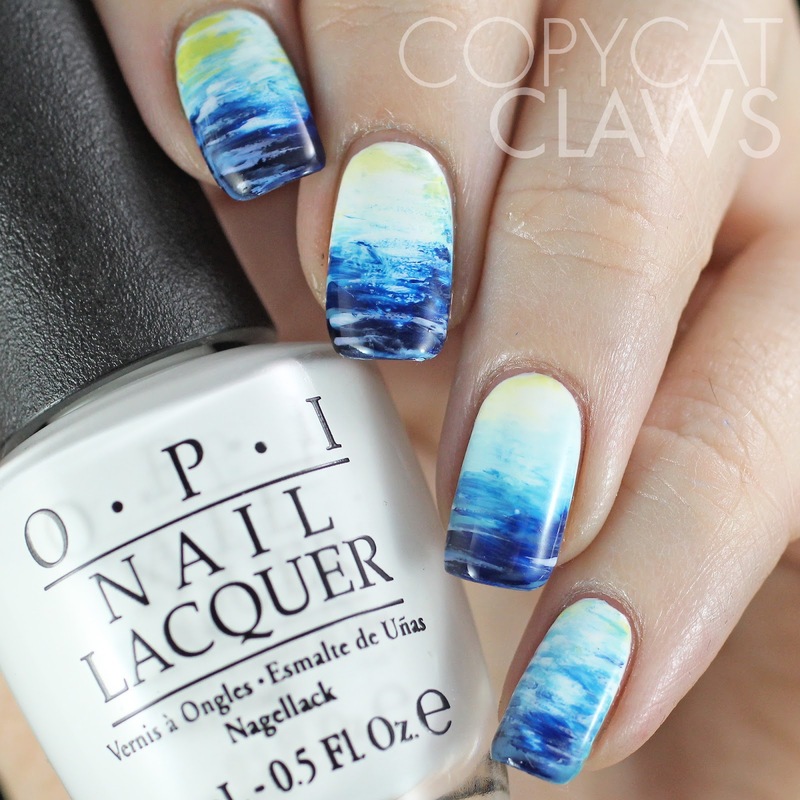 For Day 3 of The Digit-al Dozen's Nature Week, I went with another water theme. If you know anything about me, you know I LOVE being in and around water with all my heart, despite the fact that I can't swim. But water, even rough waters, has a calming effect on me and that's sort of what I wanted to portray here. The water doesn't look particularly peaceful but I know I'd feel super relaxed being around it. This mani was supposed to be a fan brush gradient but my fan brush technique never turns into the gradient that I expect it to but I tend to really like how they turn out. Hey there! 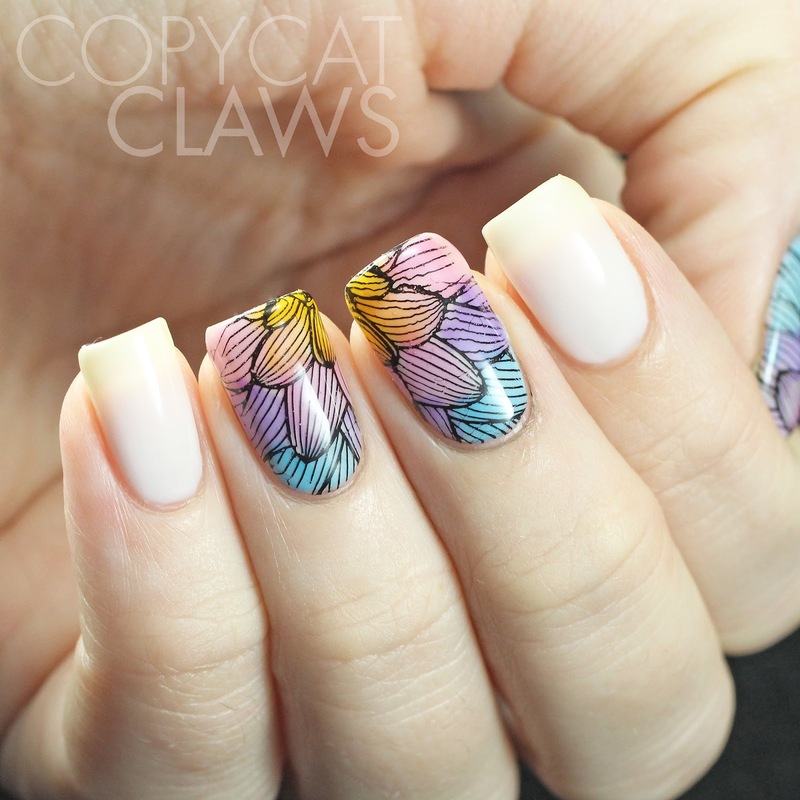 For the second day of The Digit-al Dozen's Nature week, I couldn't resist doing one of my favorite nail inspirations...butterflies! 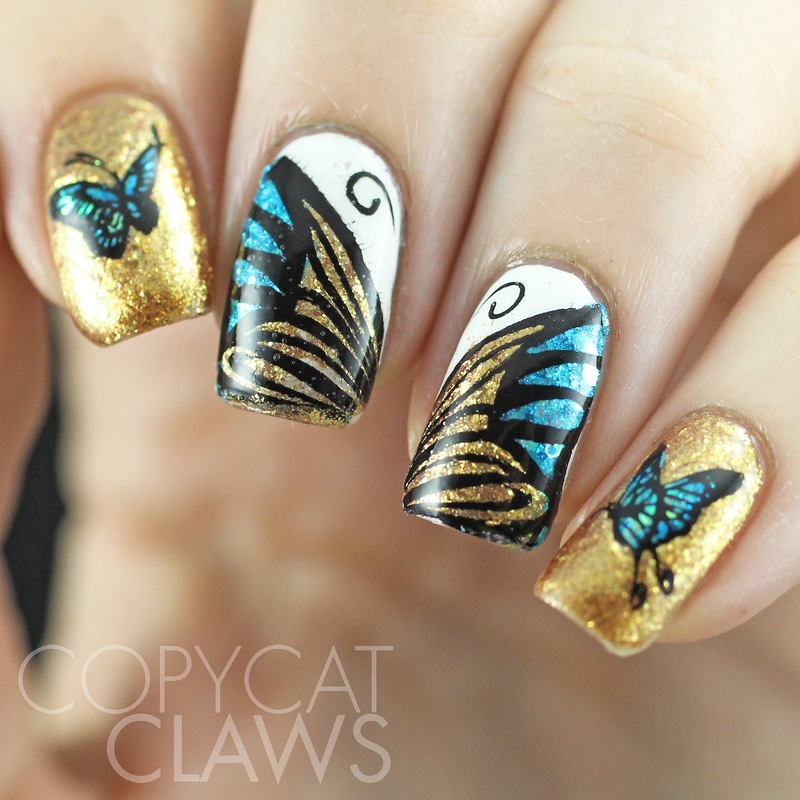 I think I like butterfly mani's so much because you can make butterflies any color and they always look pretty, just like real butterflies in nature! Hey there! 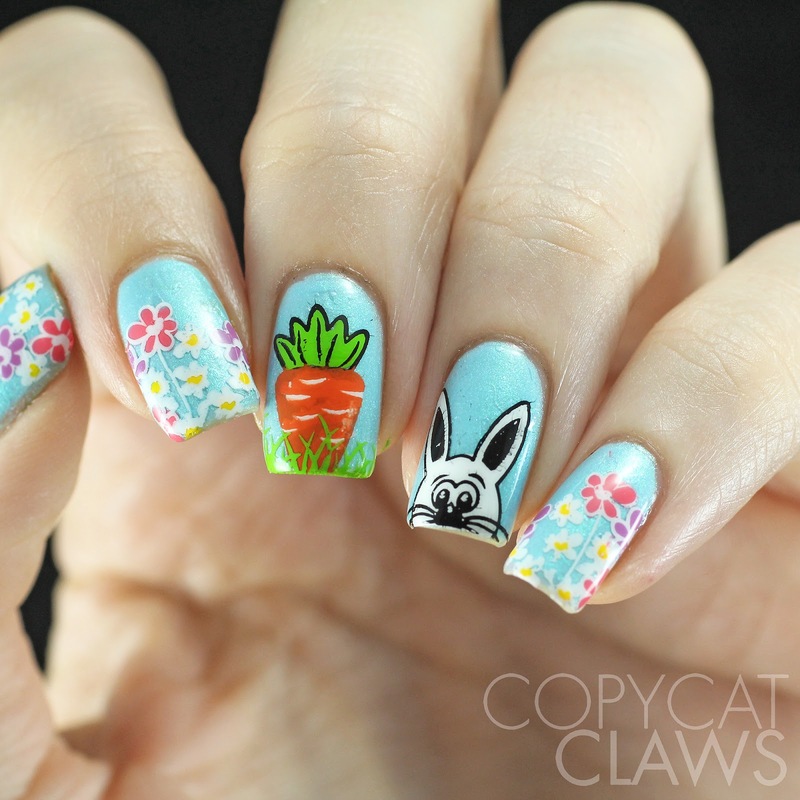 I'm so excited about this week's Digit-al Dozen theme of Nature! I wouldn't consider myself outdoors-y but I do love the outdoors (just not eating or sleeping in it, haha). I've only been a Digit-al Dozen member for a couple of months but this has by far been my favourite theme so far. My first mani also fits in with this week's Crumpet's Nail Tarts theme of Non-US Brand as I used all Picture Polish (from Australia) polishes for these. Whenever I go on vacation somewhere tropical, seeing sea turtles is always a highlight (my mom especially loves them) so I thought this would be a good start for Nature week. Hey there! Oh I'm so lazy with the blog on Sundays! These pics were all edited and good to go and yet I'm not actually writing up my Sunday stamping post until after 9 pm...and it happens every week! 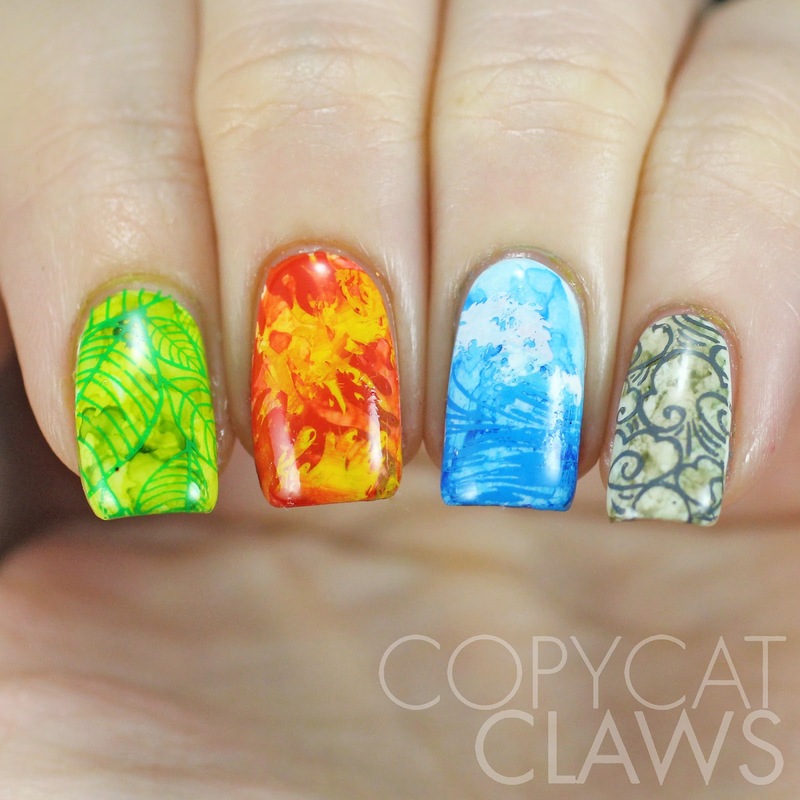 But I can't resist participating in the Adventures in Stamping themes so it's better late than never, right? 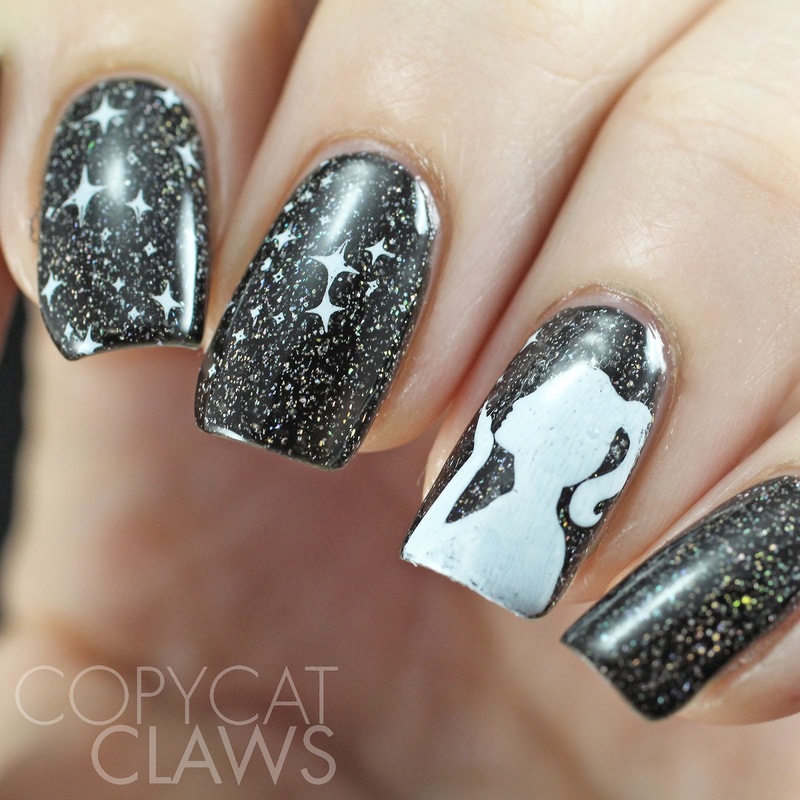 This week's theme was black & white so I used a couple of images from the UberChic Beauty stamping plates that I'm currently in love with! Hey there! It's no secret that I love F.U.N. Lacquer's glitter polishes with these ultra-holographic glitters so of course I had to buy Royal Chapel when it came out in its Christmas collection at the end of last year. 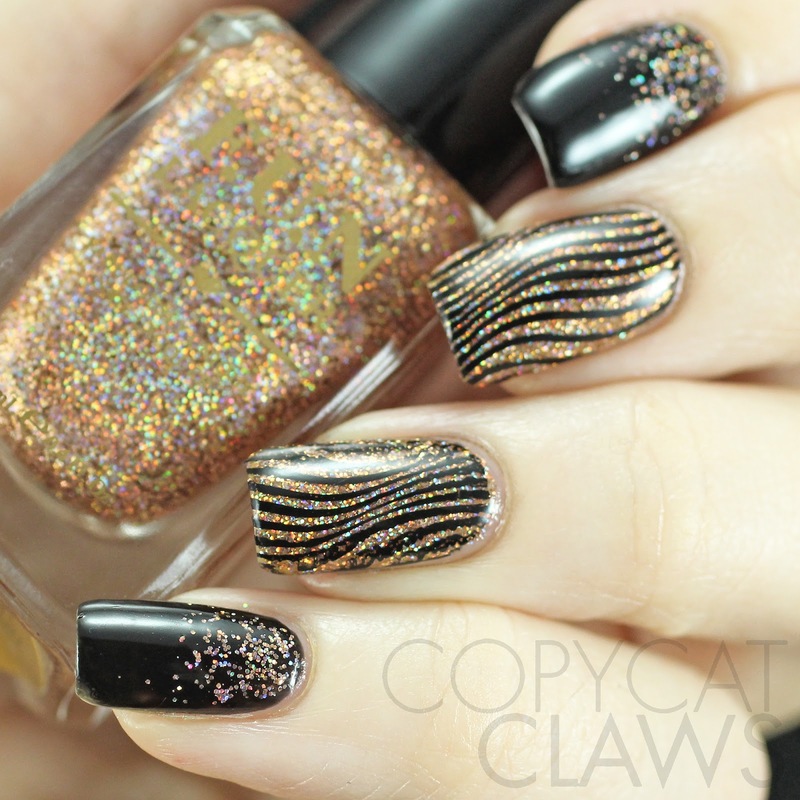 This copper-toned glitter is certainly not disappointing when it comes to sparkle-factor! 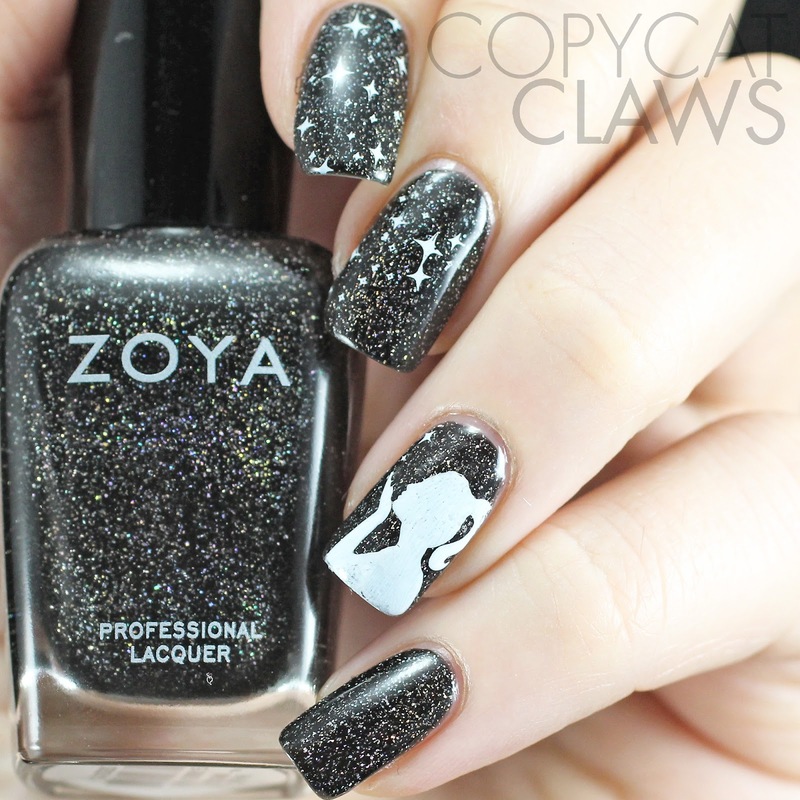 I used it here in a glitter gradient and with some UberChic Beauty stamping over it. Hey there! I meant to post this yesterday but it ended up being a hard day for my family so I didn't think blogging was appropriate. 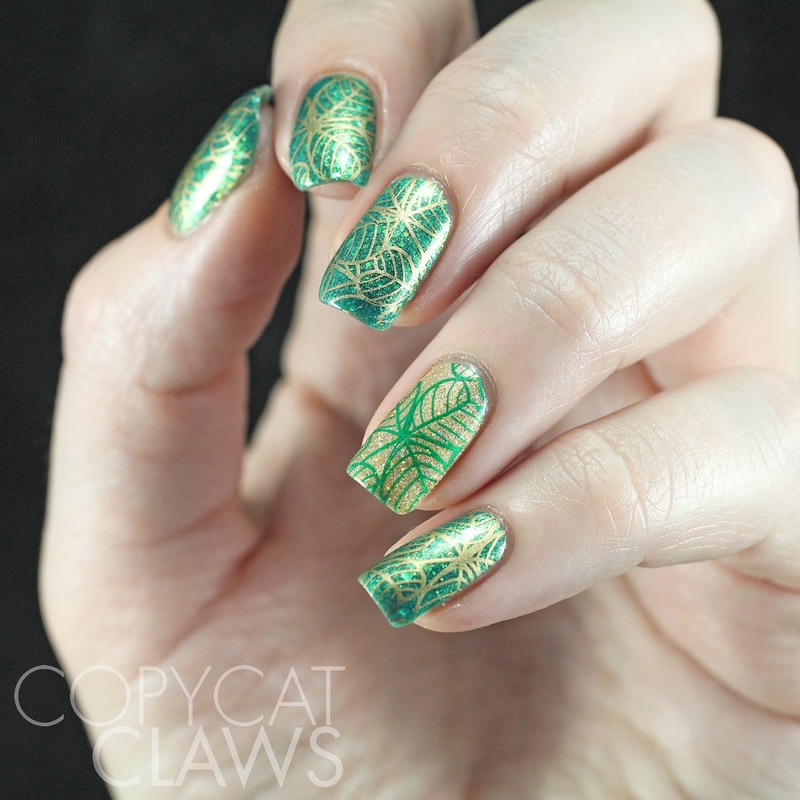 But I'm back today with some St. Patrick's Day-themed stamping that I did when I was swatching the Superficially Colorful Lacquer Sham-Rockin' Collection. Hey there! Today I have the latest collection from Superficially Colorful, the Sham-Rockin' Collection. 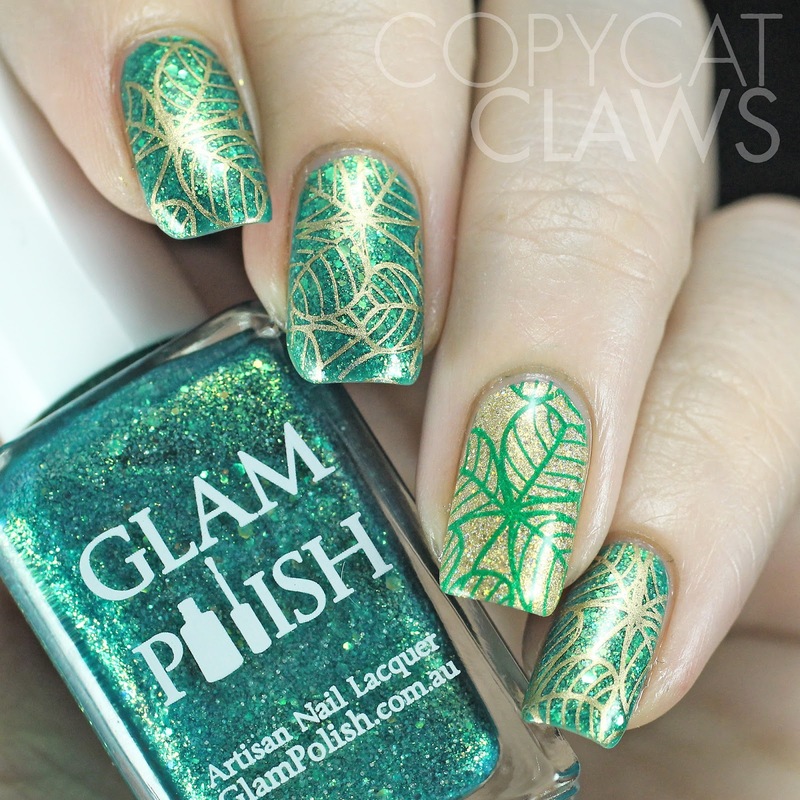 What with St. Patrick's Day just around the corner, these polishes are all suited for the holiday but are most definitely wearable year-round. The names might seem a bit oddball at first but there is an explanation - they're all based on Irish slang! 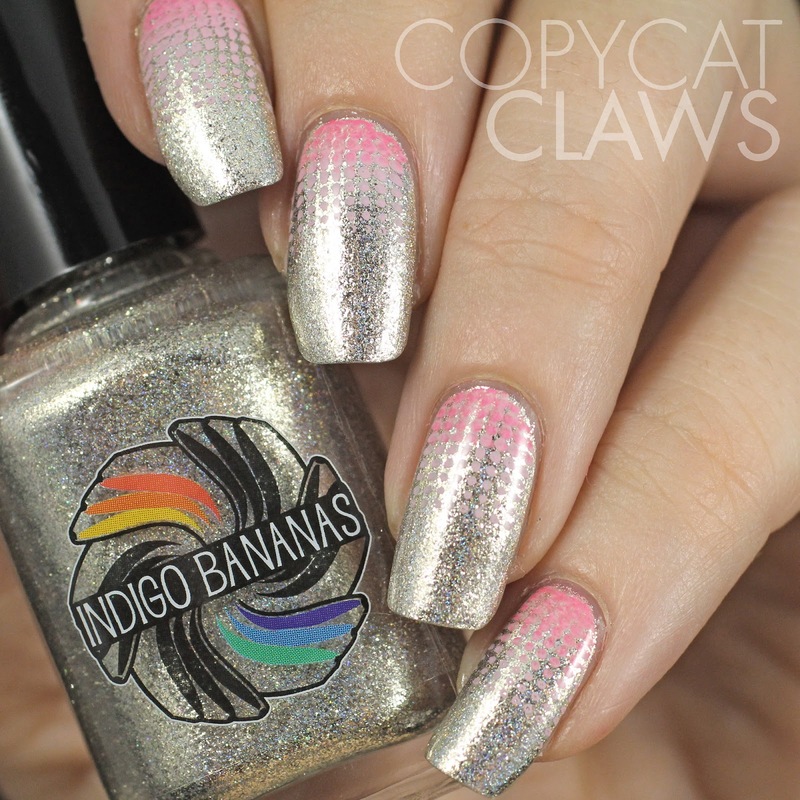 There's a little bit of everything in this collection from holos to glitters to jellies. Follow the jump to see swatches of these four colors and to read the explanation of their funny names. Hey there! 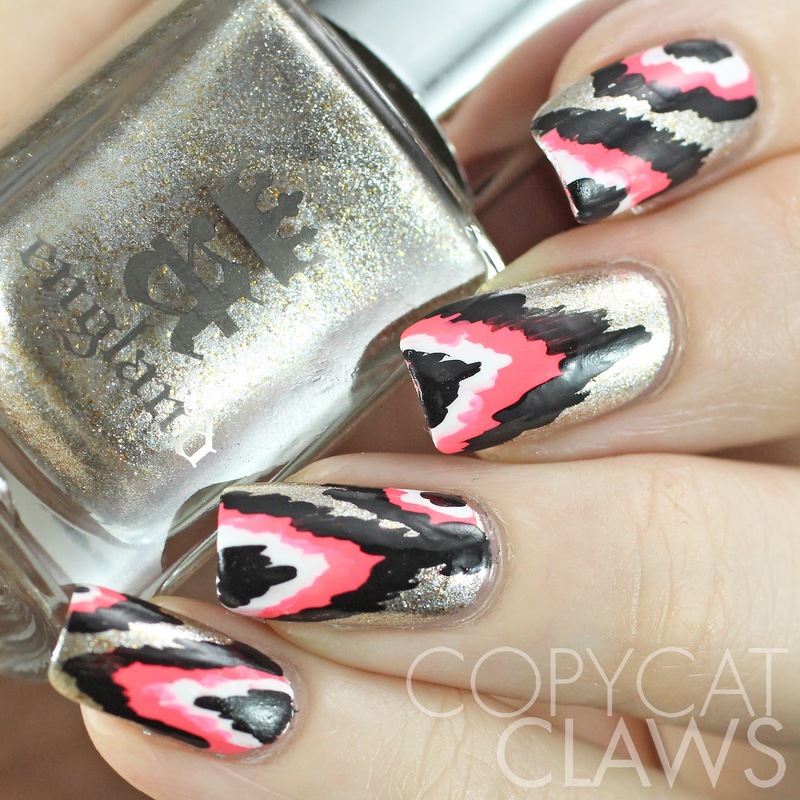 This week's 52 Week Pick n Mix Challenge themes are "metallic" and "ikat". At the risk of sound completely ignorant, I really don't understand what ikat means but a quick search in Pinterest tells me they're something like this. So I pretty much copied everyone on the internet, haha! I used a shiny base color to try to fit in both prompts. Hey there! 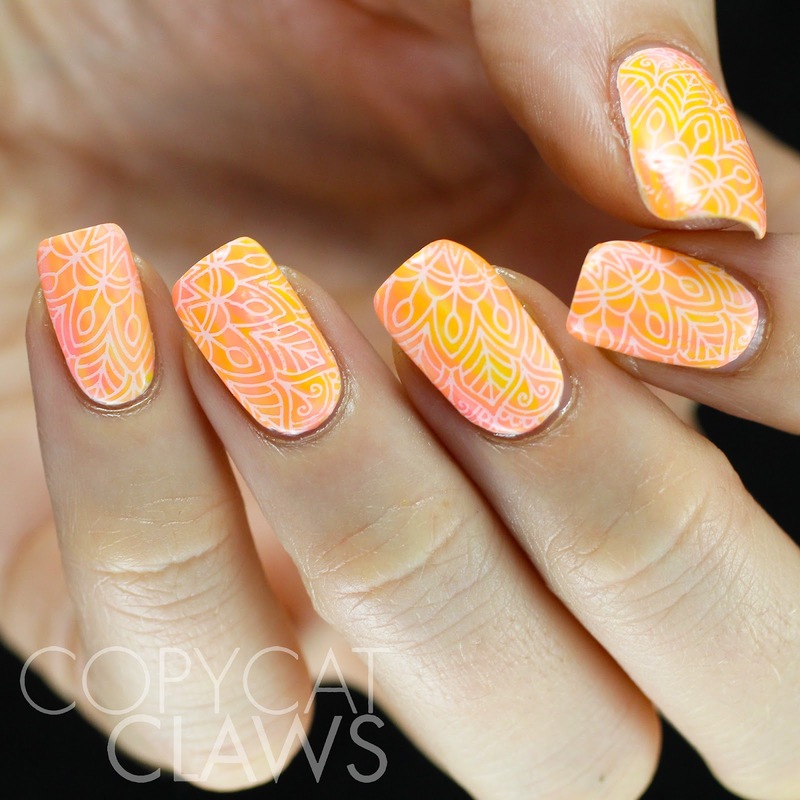 This week's Sunday stamping challenge is "Better Than Jamberry". 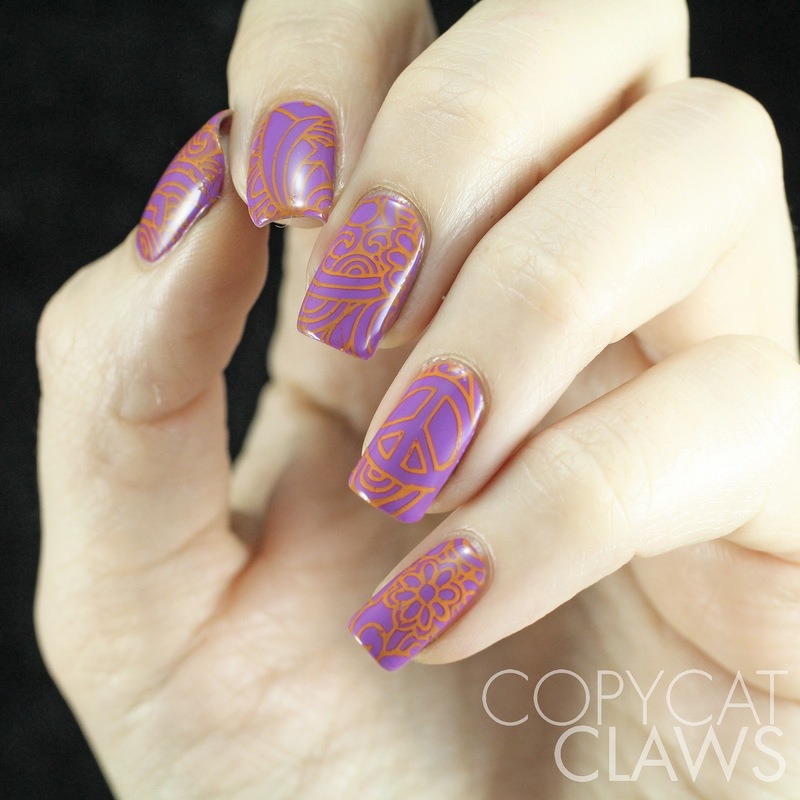 In other words, doing a stamping manicure that looks like a Jamberry Design. 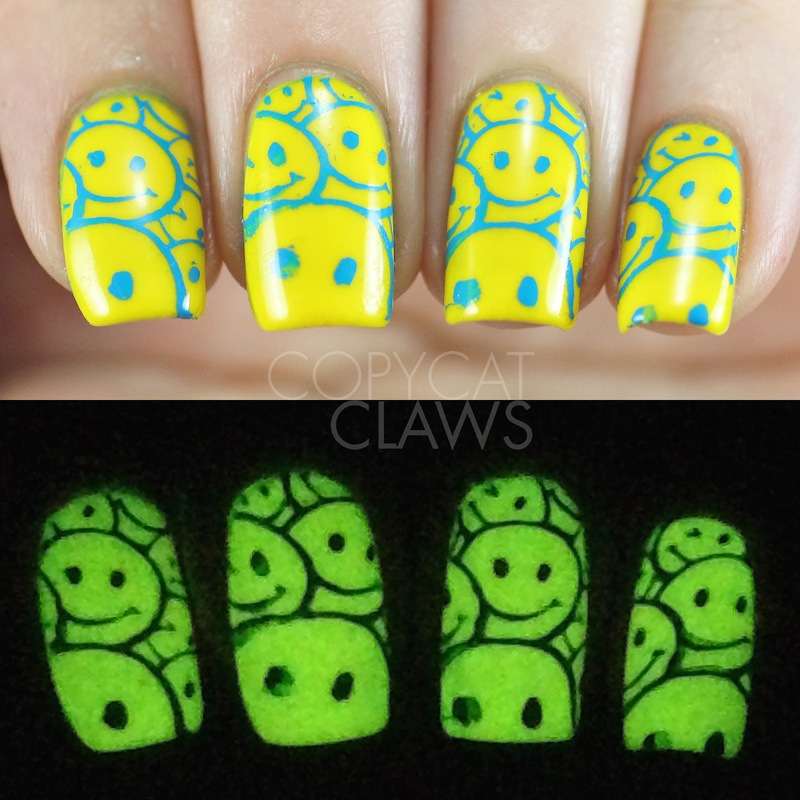 I didn't actually have time to do my nails for the challenge this week BUT, luckily, a different Facebook group had the same theme awhile back but I never got around to posting these so I can still participate this week. 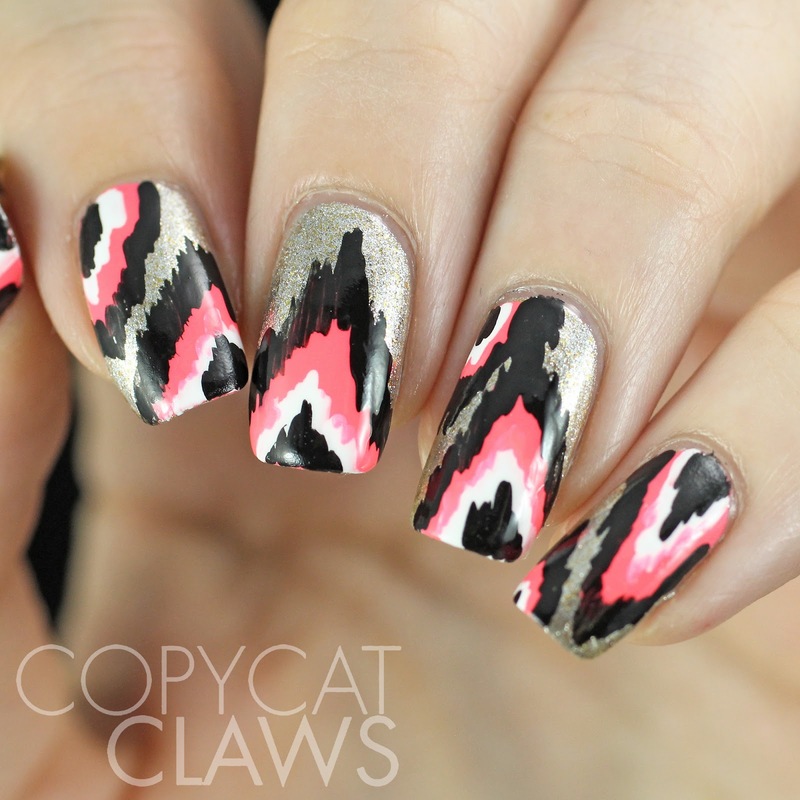 In the photo below we have my stamped nails with a comparison to the original Jamberry design.